Kerogen (Greek κηρός "wax" and -gen, γένεση "birth") is a mixture of organic chemical compounds that make up a portion of the organic matter in sedimentary rocks. It is insoluble in normal organic solvents because of the high molecular weight (upwards of 1,000 daltons or 1000 Da; 1Da= 1 atomic mass unit) of its component compounds. The soluble portion is known as bitumen. When heated to the right temperatures in the Earth's crust, (oil window c. 50–150 °C, gas window c. 150–200 °C, both depending on how quickly the source rock is heated) some types of kerogen release crude oil or natural gas, collectively known as hydrocarbons (fossil fuels). When such kerogens are present in high concentration in rocks such as shale, they form possible source rocks. Shales rich in kerogens that have not been heated to a warmer temperature to release their hydrocarbons may form oil shale deposits. The name "kerogen" was introduced by the Scottish organic chemist Alexander Crum Brown in 1906. With the demise of living matter, such as diatoms, planktons, spores and pollens, the organic matter begins to undergo decomposition or degradation. In this break-down process, large biopolymers from proteins and carbohydrates begin to dismantle either partially or completely. (According to Maurice Tucker (1988), this break-down process is basically the reverse of photosynthesis). These dismantled components are units that can then polycondense to form polymers. This polymerization usually happens alongside the formation of a mineral component (geopolymer) resulting in a sedimentary rock like kerogen shale. 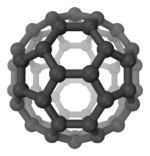 The formation of polymers in this way accounts for the large molecular weights and diverse chemical compositions associated with kerogen. The smallest units are the fulvic acids, the medium units are the humic, and the largest units are the humins. When organic matter is contemporaneously deposited with geologic material, subsequent sedimentation and progressive burial or overburden provide significant pressure and a temperature gradient. When these humic precursors are subjected to sufficient geothermal pressures for sufficient geologic time, they begin to undergo certain specific changes to become kerogen. Such changes are indicative of the maturity stage of a particular kerogen. These changes include loss of hydrogen, oxygen, nitrogen, and sulfur, which leads to loss of other functional groups that further promote isomerization and aromatization which are associated with increasing depth or burial. Aromatization then allows for neat molecular stacking in sheets, which in turn increases molecular density and vitrinite reflectance properties, as well as changes in spore coloration, characteristically from yellow to orange to brown to black with increasing depth. As kerogen is a mixture of organic material, rather than a specific chemical, it cannot be given a chemical formula. Indeed, its chemical composition can vary distinctively from sample to sample. Kerogen from the Green River Formation oil shale deposit of western North America contains elements in the proportions carbon 215 : hydrogen 330 : oxygen 12 : nitrogen 5 : sulfur 1. Labile kerogen breaks down to form heavy hydrocarbons (i.e., oils), refractory kerogen breaks down to form light hydrocarbons (i.e., gases), and inert kerogen forms graphite. A Van Krevelen diagram is one example of classifying kerogens, where they tend to form groups when the ratios of hydrogen to carbon and oxygen to carbon are compared. Shows great tendency to readily produce liquid hydrocarbons. Tend to produce a mix of gas and oil. They all have great tendencies to produce petroleum and are all formed from lipids deposited under reducing conditions. Similar to Type II but high in sulfur. Material is thick, resembling wood or coal. Type IV kerogen contains mostly decomposed organic matter in the form of polycyclic aromatic hydrocarbons. They have no potential to produce hydrocarbons. The type of material is difficult to determine, but several apparent patterns have been noticed. Ocean or lake material often meet kerogen Type III or IV classifications. Ocean or lake material deposited under anoxic conditions often form kerogens of Type I or II. Most higher land plants produce kerogens of Type III or IV. Some coal contains Type II kerogen. Carbonaceous chondrite meteorites contain kerogen-like components. Such material is thought to have formed the terrestrial planets. Kerogen materials have been detected in interstellar clouds and dust around stars. ↑ Teh Fu Yen; Chilingar, George V. (1976). Oil Shale. Amsterdam: Elsevier. p. 27. ISBN 978-0-444-41408-3. Retrieved 31 May 2009. ↑ Hutton, Adrian C.; Bharati, Sunil; Robl, Thomas (1994). "Chemical and Petrographic Classification of Kerogen/Macerals". Energy Fuels. Elsevier Science. 8 (6): 1478–1488. doi:10.1021/ef00048a038. ↑ D. R. Steuart in H. M. Cadell et al. Oil-Shales of Lothians iii. 142 (1906) "We are indebted to Professor Crum Brown, F.R.S., for suggesting the term Kerogen to express the carbonaceous matter in shale that gives rise to crude oil in distillation." ↑ Kudzawu-D'Pherdd, R., 2010. "The Genesis of Kerogen, a write up in Petroleum Geochemistry" - (EASC 616), Department of Earth Science, University of Ghana-Legon, (unpublished). ↑ Teh Fu Yen; Chilingar, George V. (1976). Oil Shale. Amsterdam: Elsevier. ISBN 978-0-444-41408-3. ↑ Tissot B. P., Welte D. H., “Petroleumformation and occurrence”, Springer Verlag Germany, 1984. ↑ Weber G., Green J., ‘‘Guide to oil shale’’. NationalConference of State Legislatures. Washington D.C. USA.p. 21, 1981.